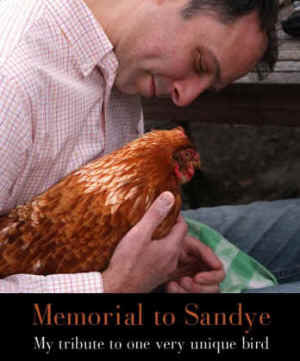 Sandye the hen passed very suddenly on Halloween morning after spending her last three years in generally good health. We suspect she was in her “golden years.” I found her lying on her side at the entrance of the coop. Her eyes were closed. She was breathing, but very still. When I picked her up to bring her in the house, her body felt weak and limp. While I did not want to admit it yet, I immediately sensed she was preparing to die. Sandye was reportedly acting completely normal just the day before. I was away for a few days and left her and the other hens in the care of my competent friend Linda. So her turn for the worse came on very suddenly. Linda and my neighbor Cin thought that Sandye waited for my return, so that I could be with her during her passage from this life. I’m so glad I was here to spend her last hour with her. In the house, I gently sat her down on a towel, stroked her back and consoled her in a soft voice. I sensed all the while that she was slipping away. I left her to rest quietly for a few minutes and then came back to watch over her. I noticed her head twitching a bit so I rested my palm behind her head. At that moment she opened her eyes for just a moment and looked up at me. Then she twisted her head back and her legs stretched out and curled in an odd way, and she breathed two last deep breaths that ended with a slight gurgling sound. Then her eyes closed very slowly and her body went completely limp. I’ve never seen the life leave a body before. It filled me with awe and a sensation I will never forget. At that moment I realized that life is just some uncontrollable, precious, ephemeral and mysterious force. The body is merely a vessel through which the life force flows. It’s the same for all of us — humans and chickens alike. Sandye’s death made me keenly aware that not only is life itself a mystery to us, but her life before I adopted her was also a complete mystery. I’ll never know how old she was when she died. I’ll never know what shaped her unique and introverted personality. The morning after Sandye’s death, the sun came through the morning clouds. I saw the sun’s rays in the yard, and I immediately thought of her. I almost went to the kitchen window to see if she had already found the sunny part of the yard as she typically did. Sandye enjoyed being in the sun more than any of the other hens, especially on cold autumn and winter days. Even if there was just one sliver of sunshine in the backyard, she would go find it and position herself in it to soak in its warmth and energy. It was a joy to witness how gracefully she radiated in that sunshine. It gave me great pleasure to see her enjoying this experience so much and so often. Indeed, the sun was vital to her happiness and well-being. How could the sun still shine without Sandye in it, I thought? It just didn’t make sense. For the first time, the sun brought me grief. In the last few weeks of her life, Sandye had became more passive and withdrawn from the others. She had not come out of the coop in the morning with the others, instead emerging an hour or two later. And during those final days, she had stopped climbing the ramp up to the coop — a trek she had made along with the other hens for about three years — even though she was walking and even running around with ease. On a couple of occasions, I observed her as she made a conscious choice not join the others in the coop for the night and instead find privacy under the coop. Left to her own devices, she would have remained there had I not picked her up and placed her in the coop. Was she trying to find a private place to die? Sandye was an exceptionally quiet, stoic and peaceful hen. Her only vocalization was her characteristic soft squeal — a truly unusual and curious sound indeed and actually very pleasing to the ear. Sandye was nonetheless a deeply loyal companion of mine and would express the connection she felt for me in her typical stoic fashion. In the warmer months, I’d often sit outside on the patio, working on my laptop, and at some point, I’d look down and find her sitting at the base of the table by my feet. And there she would remain for long periods of time. I’d often pick her up and sit her in my lap. She was so very content to remain there as well. Sandye’s passing made me think about my own mortality and the mortality of others too. My wise friend Pamela Ziemann posed a great question the other day: If Sandye did indeed die of natural causes and with little suffering, as I sincerely hope, and in the presence of the guardian who loved and cared for her, isn’t that what we hope for ourselves and for all of our loved ones? And should we not extend that wish to every animal, even those we will never see or know? If so, then we are obligated to choose a humane path in life that does not impose violence on others — because we can.